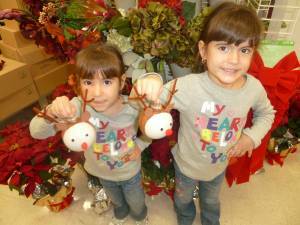 at Michael's & made the cutest Reindeer ornaments! 1. They used a clear shatter proof ornament and the girls sponge painted it dark brown with enamel paint. 2. We waited for it to dry a bit and applied a 2nd coat - the painting took awhile! 3. While we waited for paint to dry we cut ears out of foam and make antlers from pipe cleaners. 4. We painted a cream color face using a small paintbrush to one side of the ornament - more drying time. 5. Then I used a hot glue gun to attach the wiggly eyes, red pom pom nose, ears & antlers! 7. I wrote their names & the year on the back so we could remember when they made them later! an adorable addition to our Christmas tree!